In 2019, PBFC will continue its successful GAP Program. This program is open to players turning 8 years to 11 years of age and of all abilities. This is the decisive age group for acquiring the perfect technical foundation (the ‘Golden Age Phase’ of motor learning). Some of the key trademarks we seek include: team spirit, discipline, responsibility, co-operation, understanding, courage, pride and respect. Our coaching philosophy is to create an environment that encourages and embraces open communication between players and staff. This year our Head Coach – Steve Lawrence will run the GAP for the 2019 Season. Steve comes with a long list of achievements in Junior Football Development. We are very lucky to have his experience and knowledge. PBFC is offering the GAP program as part of your registration fees this year, exclusive to PBFC players as an extra value-add to your child’s football development this year. Goalkeeper training is available to all teams at PBFC. 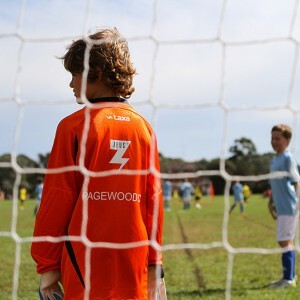 The program is FREE to members of Pagewood Botany Football Club. The specialist coaches are fully qualified in delivering the program. Keepers are put into age/gender groups and are taught basic technique of handling/diving and as they progress every other aspects of the position. SESSIONS ARE HELD EVERY WEDNESDAY AT JELLICOE PARK. Bring Gloves. However if required, GK Gloves are also available for purchase at your session.